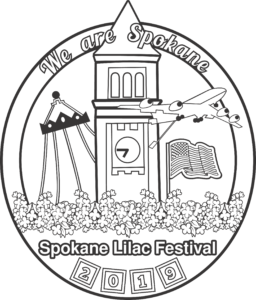 Celebrate “We Are Spokane,” the 81st Spokane Lilac Festival, and enter the “Color Me Lilac” coloring contest. All ages are invited to participate and entries will be judged by a panel selected by the Spokane Lilac Festival. Entries will be judged on creativity in design and use of medium. Winners will be selected in five divisions: ages 4 and younger, 5-7, 8-12, 13-17, 18 and older. Winners in each age division will be featured in The Spokesman-Review, the Festival’s print media sponsor, on May 18, 2018. One overall Grand Prize winner will ride in a vehicle in the 81st Annual Lilac Festival Armed Forces Torchlight Parade in downtown Spokane the evening of May 18. As many entries as possible will be displayed at River Park Square, 808 W. Main Ave., starting May 11. All entries are subject to approval by officials from The Spokane Lilac Festival. Entries may not be digitally enhanced. Entries that are obscene, defamatory, threatening, off-topic, an infringement of copyright or an invasion of privacy will be not be considered. Submissions may be dropped off at The Spokane Lilac Festival office located at 3021 S. Regal, Suite 105, Spokane, WA 99223 or mailed to the same address to the attention of The Spokane Lilac Festival Contest. Post marks will be honored. PLEASE ATTACH SEPARATE PIECE OF PAPER THAT INCLUDES YOU RADDRESS AND TELEPHONE NUMBER SO YOU CAN BE CONTACTED IN THE EVENT YOU WIN. Current employees of The Spokane Lilac Festival and The Spokesman-Review/Cowles Company are not eligible to win. Contestants hereby irrevocably authorizes The Spokane Lilac Festival/The Spokesman-Review to edit, alter, copy, exhibit, publish or distribute this entry for purposes of publicizing The Spokane Lilac Festival/The Spokesman-Review programs or for any other lawful purpose. The contest runs from 8 a.m. March 31, 2019, until 2 p.m. May 1, 2019. Winners in five age divisions and a grand prize winner will be selected by a panel of judges selected by the Spokane Lilac Festival Association. Selection will take place on May 7th and winners announced May 18th in the Spokesman Review. Grand prize winner will be notified by telephone. Grand prize may not be substituted and is not refundable or redeemable for cash. Grand prize must be redeemed on May 18, 2019. The winners names in each of the five age divisions and grand prize winner name will be available for 10 days after the end of the contest, and may be requested by sending a request to The Spokesman-Review, 999 W. Riverside, Spokane WA, 99201, Attn: The Spokane Lilac Festival Coloring Contest. All federal, state and local regulations apply. Void where prohibited. For additional rules or contest questions, please contact The Spokane Lilac Festival office at 509.535.4554. Please attach a separate piece of paper that includes your address and telephone number so you can be contacted in the event you win. Your personal Information will not be shared.